"A high standard hotel with hot springs. It wasn’t authentic enough for us as the accommodation was too American and could have been anywhere in the world "
"I can't fault the hotel it was just not what i was expecting. It's a sanitised American resort. Yoga class great and breakfast first class. On reflection we would have been better in smaller hotel nearer the village. Hanging bridge tour good, walking not at all difficult. Nice to have fruit and iced tea at the end." "We thought we might need a bit of respite by the time we got to La Fortuna, so we chose a place which would be modern, comfortable, and uncomplicated. In fact, Tortuguero and Sarapiqui were so good that this wasn't really necessary. Arenal Springs is fine - very comfortable rooms, great views of the volcano from the veranda, and a range of hot spring pools. However, the Floridian designers have brought the Truman Show to Costa Rica with their rows of little houses, and allowing guests to drive their own cars - and buses - around the site is not a smart idea." "Our favourite location of the holiday in an exciting area. Our chalet offered good views of the volcano and was exceptionally well-appointed. The food was excellent as was the service and attention to detail. We were greeted with a welcoming cocktail and cold towel. All other amenities at the hotel lived up to the same high standard." "Wow - what rooms - 6 star quality (better than I found in many business trips in Dubai ! ) - beautiful rooms, jacuzzi in the bathroom and jacuzzi on the balcony terrace. Great food in the restaurant. $10 taxi each way to Fortuna but not much of a town, so better to spend the fare in the hotel restaurant ! The hanging bridges walk was ok but too many tourists and midday meant few birds to see. We saw Acoti and an eyelash viper and a few birds. " "Tremendous view of Arenal Volcano from our room and from most of the site. Big plus was the thermal pools which were open until 10 pm. These were a real tonic after long days of exploring. The room is described as a junior suite but doesn't have a seating area just two double beds. Lots of lovely birds on site. Watch out for Passerini's Tanager. " "Odd room configuration in that we had the massive room with all the baths etc I referred to earlier while our friends had a much smaller standard sized room next door. There was an adjoining door which we had to ask to have closed. I think the suite they put us in was actually a family suite. Our friends oddly had no hot water in their sink but did get a reduction off their bill when it became evident they couldn’t immediately fix it! " "Great accommodation and the thermal baths are excellent. Unfortunately only one restaurant was open. This was the pizza restaurant which meant very limited choice for the gluten intolerant person in the party. We therefore ate in Fortuna at Inspira, a great new restaurant that is well worth a visit." "Relaxing time with lovely spacious rooms. Staff really friendly." "Beautiful surroundings attracting birdlife including Humming birds"
"Mixed reviews from our party. Some people liked the luxury, especially the wet bar! Others (i.e. me) found it all too Fat American - the golf buggies and the Stepford Wives hut layout etc. The food was OK, but overpriced, so we spent most of our evenings escaping to the nearby town (La Fortuna), which we really liked." "Wow. What can we say? This was a much busier hotel, but didn't really feel like it. The individual lodges were spacious and comfortable - and the towel animals were brilliant. Incredible views of the volcano. Gorgeous hot spring pools - you can even eat at the sushi bar without leaving the pool. The welcome team were very attentive, and even took our bags by golf buggy. They changed our room so that were next to a family who we had met earlier in the holiday. This attention to details and customer care was maintained throughout the holiday. We are not used to this sort of luxury, which was rather a contrast to Tortuguero's rustic charm." "Relaxed luxury, friendly, fun. Clean and very well,managed. " "A lovely hotel in a superb setting"
"Very comfortable and the springs and the view of the volcano were lovely. A bit impersonal and American for my tastes but for a two day stay not a problem "
"Spacious room (in fact, a semi-detached chalet) with marvellous views of Mt. Arenal. Beautiful, well-maintained surroundings. Pools and hot springs perfect for relaxing in. Restaurant menu rather disappointing as it was restricted to Italian dishes." "Arenal Springs not so good. After independance day weekend (which was busy with a good atmosphere), we were down to one restaurant, an Itallian, which left us with little choice. They added the most expensive items from the other restaurant on to the menu. It was much overpriced but we felt kind of trapped not being in walking distance of the town. We got a taxi in the end. Generally the hotel felt like it was half shut. Having said that the rooms were spacious, staff efficient, food good but probably a high season place to stay. Views of volcano from every room. Area good for activities, loads to do. " "Super hotel, food etc a bit pricey so we used the local town to eat etc. absolutely everything about the hotel was superb and the staff excellent." "Fabulous lodge with great volcano views. Lovely hot springs and decent food." 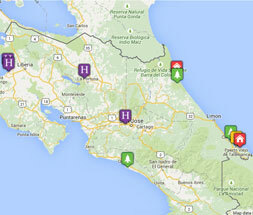 "Highlight -Hotel hot springs with included green iguana !!" "Lovely gardens and pools, good food, great views of volcano."